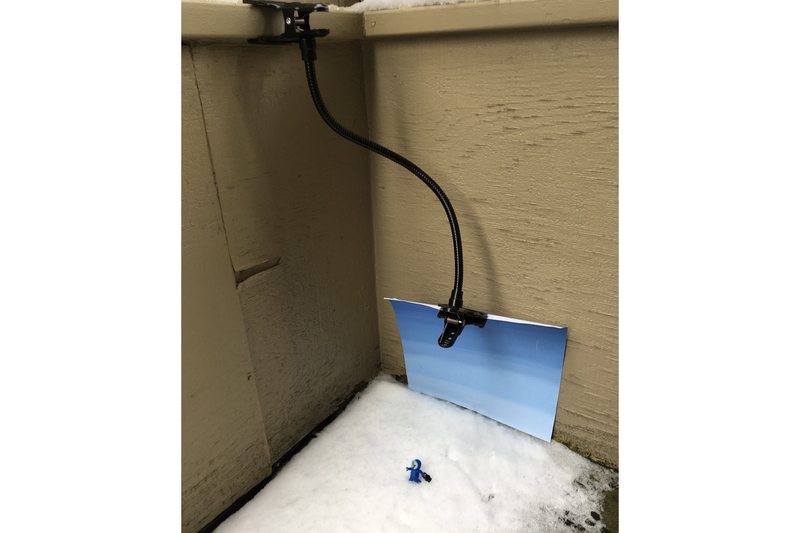 This week, something unexpected happened: I woke up to find that, thanks to some record low temperatures, the rain that had been pervading the Pacific Northwest had turned into snow, replacing the familiar green scenery with a surprising winter wonderland! I’ve always loved the snow. 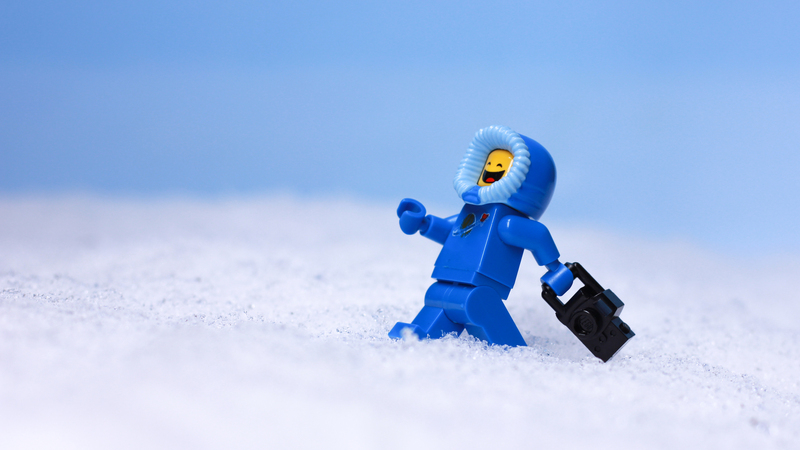 I grew up in Nevada, where it snows pretty heavily throughout the winter, and have many fond memories of building snowmen, engaging in snowball fights, and the thrill of an unexpected snow day. 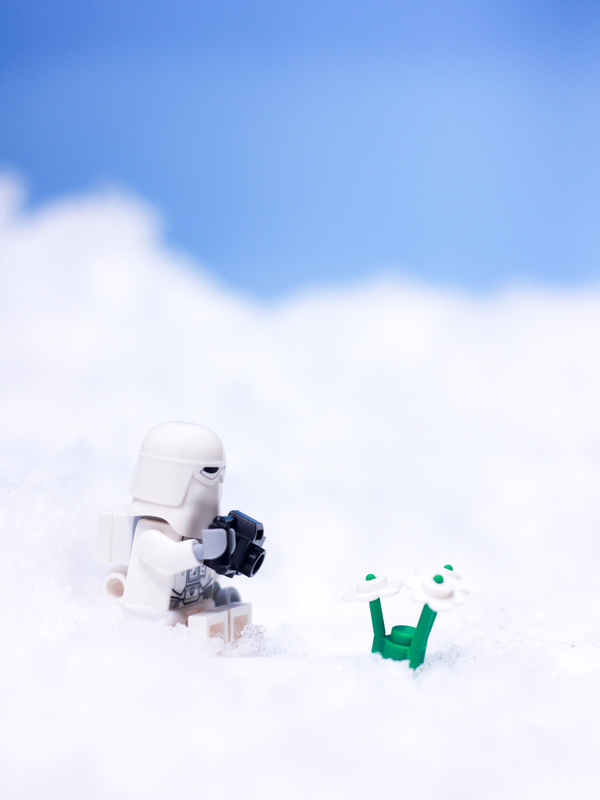 I relish at the opportunity to photograph in the snow because I absolutely love the way it looks in toy photos! In the last few months, especially leading up to Christmas, I employed Brett’s method of fake snow for my shots, but there’s simply nothing quite like the real thing! Because the snow came as a surprise, I was woefully unprepared for it. I don’t own a pair of boots, meaning that any trek out into the world would leave me miserable very quickly. I also wasn’t looking forward to the cold; shooting with toys requires me to be dexterous, so wearing thick gloves or many layers of clothing would inhibit my movement and make it harder to shoot. Despite these hurdles, I didn’t want to miss out on the snow, knowing it would melt in a matter of days. So, I gave myself a little challenge: Could I shoot close to home, but make it look like I had braved the wilderness? Luckily for me, my apartment has two small back patios, one of which is covered. The covered patio is a go-to photo spot for me when I want to shoot outdoors but don’t want to venture very far. The ledge is just wide enough to hold my minifigures without much risk of them falling down three stories, and we’re surrounded by trees that serve as an excellent backdrop. As you can see, the patio got just enough snow for me to play around with. I started by photographing on the ledge, using the trees to convey that I was in the woods. While I’m extremely happy with these two shots, shooting on the ledge gave me one big limitation: I only had about 3 or 4 inches of depth to work with. There’s a pretty sharp drop-off from the snow to the background, and ideally to make it look more realistic I’d like there to be more snow, out of focus in the background. To accomplish that, I would need more snow, so I looked at what had fallen on the ground. If I shot by looking left or right instead of forward, I could use the longer stretch of snow to my advantage. The one problem was the ugly brown siding of the patio. I got around this by bringing out one of my favorite paper backdrops and using a clamp to hold it up, just high enough not to touch the snow and ruin the paper. In retrospect, I guess I could have just taped it to the patio, but where’s the fun in that?? 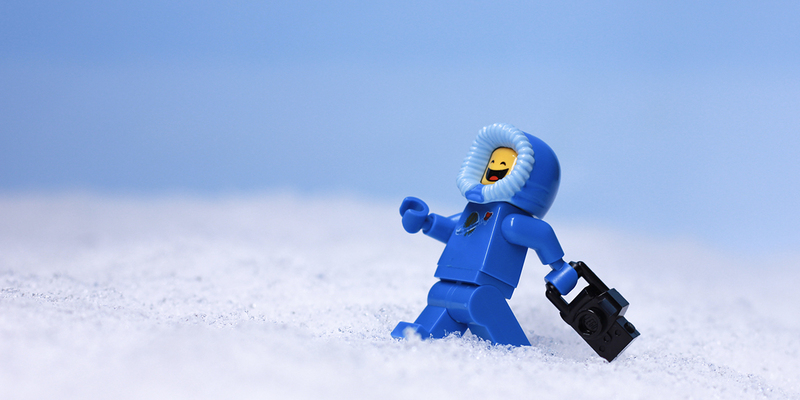 Now Benny is out in the wilderness, ready to take great snow photos! 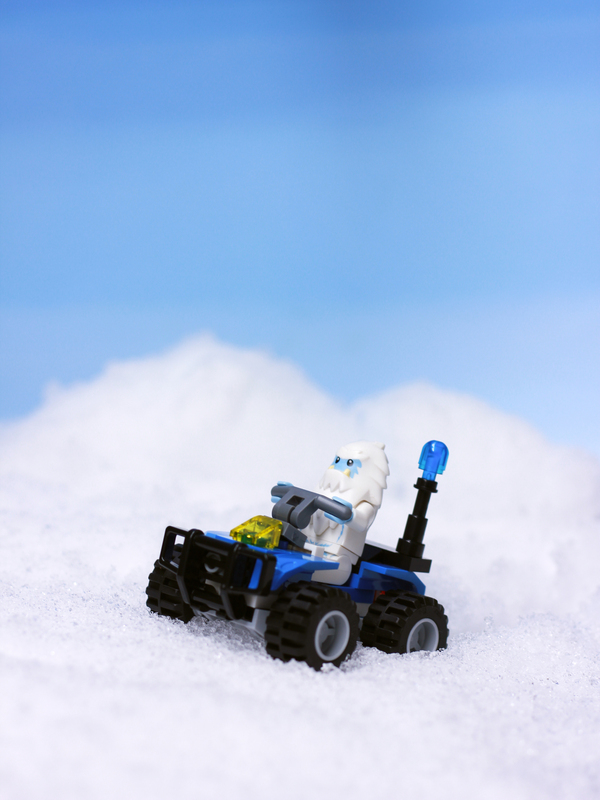 I had much more versatility once I brought out the blue backdrop and had more snow to play with in the background! 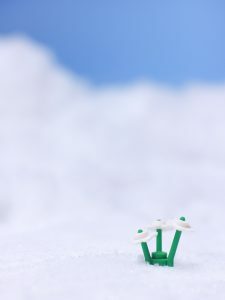 To add a bit more realism, I scooped up some snow and made little mounds that looked like snowy hills in the distance. My favorite snow shots have always been those that show a vast white wilderness juxtaposed against a clear blue sky. My one caveat to that approach is that all of these images look pretty similar, and honestly don’t look that different from something I could have shot in my studio. The snow itself is fantastic, but if I were to do this experiment again I would try to add even more to the background, like some trees, to make the shots more distinct. 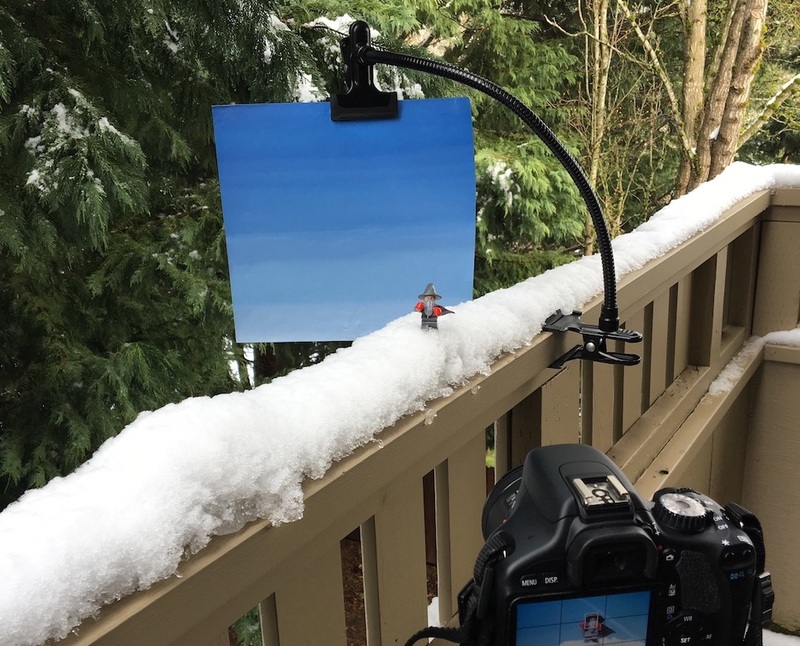 One final thing I tested was the blue backdrop against the snow on the ledge (I admit that part of this was because I was having fun using the clamps). 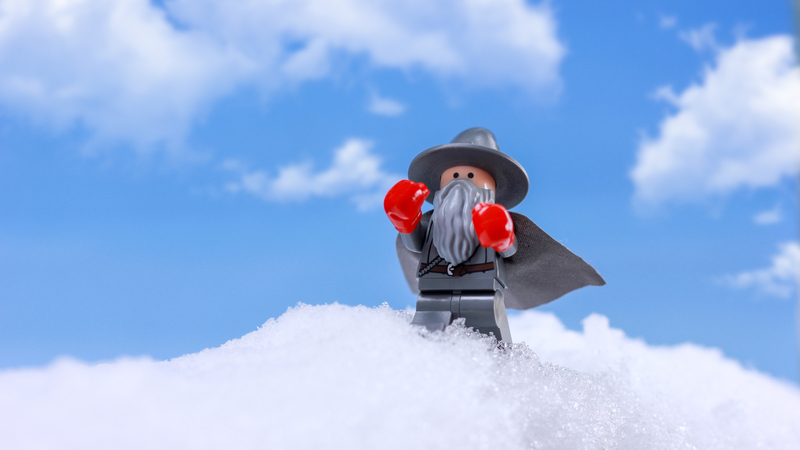 I captured one image I was happy with, this shot of Gandalf getting ready to fight the Balrog. All in all, I think this was a successful experiment, even if I didn’t quite achieve the level of realism I was hoping for. I’m looking forward to the next bit of snowfall so that I can try again with some more props and scenery. 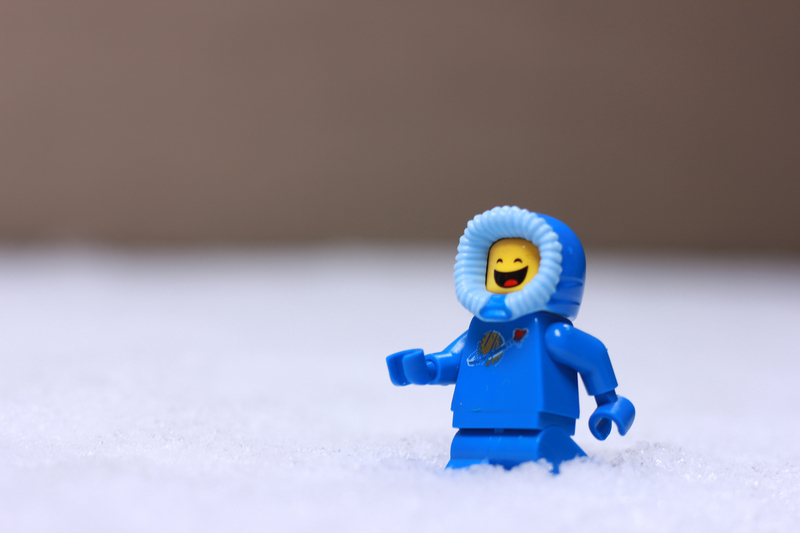 Have you ever “fake” played around in the snow or other elements? Let me know in the comments below! If you like what we’re doing we invite you to support the blog by purchasing our book that celebrates our first year as a blog: A Year in the Life of Toy Photographers, 2017. The book is available for purchase as either an eBook or as a physical copy. All money will go to support and grow the blog. Thank you! Phantastic photos, James. And I am glad you also shared the behind the scenes pictures, just so we can see how you make believe. Thanks! Thank you so much, Tobias! I take BTS photos almost every time I photograph, but I usually forget to share them. I’m hoping to do more articles like this in the future to shed a light on some things. I’m in awe of the amount of snow that you got. I’m also in awe of those beautiful trees that right outside your patio – wow! Thank you Lynn! 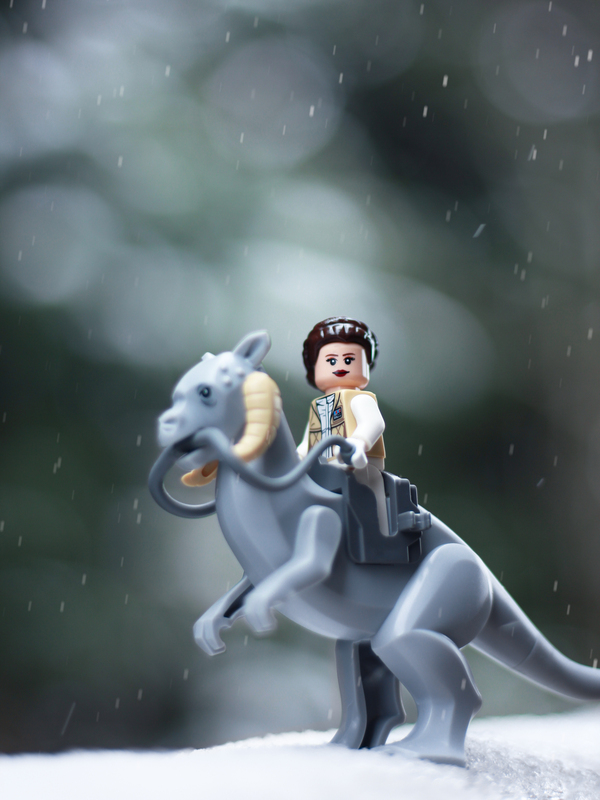 The Leia photo is my favorite as well and unlike most shots I usually take. We really lucked out with our apartment location; our building is in the very back corner of our complex and there is a big open lot right behind those trees. I love taking photos out there! I was in awe of the snow too, it only lasted a couple of days. Today I was driving around and you couldn’t tell at all that it had even happened! I’m bummed. I’d say that these photos took me about 2 hours. I didn’t take them all at once, I did two sessions on two different days. First day was playing around on the ledge, then the next day I brought out the clamps and the backdrop! I honestly haven’t gotten a ton of use out of them (I usually just tape the backgrounds to the back of my lightbox) but when I do need them, they’re great! I got them pretty cheaply off Amazon. Thanks, Shelly! Until this experiment it never really occurred to me to bring backgrounds out into the world with me, but it’s something I think I’ll try more often, just in case of similar situations.